Public works departments across North America rely on Elliott for highway lighting and sign work, facility and airport maintenance, bridge and tunnel repair and more. 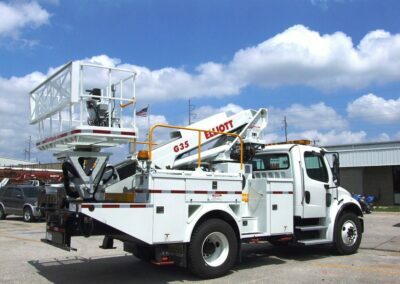 With a wide range of working heights and crane capacities available, Elliott has the right tool for the way you work. 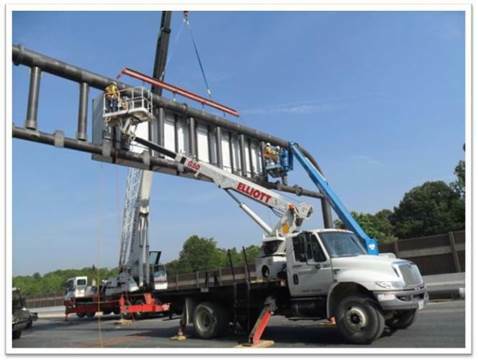 From under-bridge inspection to roadway sign maintenance and construction, Elliott has specialized solutions for your most challenging jobs. Our engineers will work closely with you throughout the process to make sure you get just what you need to help you work more efficiently and safely. 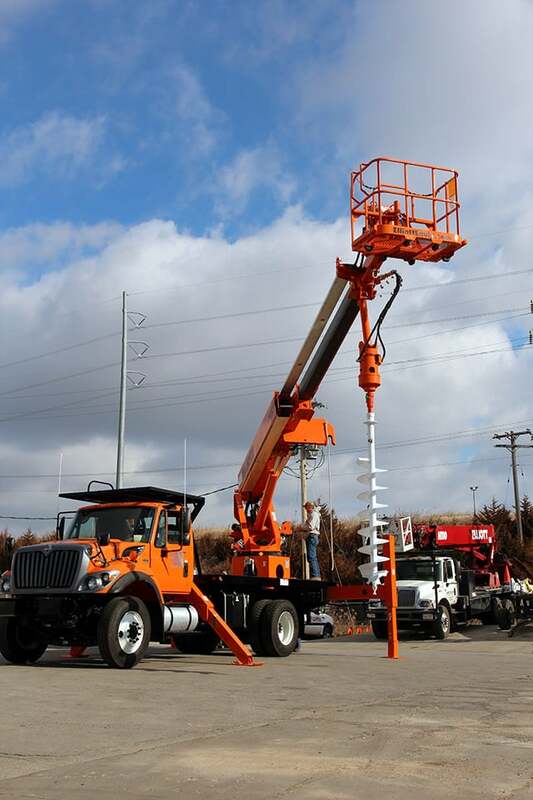 With the Elliott HiReach, you can invest in a single machine that will do the work of three or more pieces of equipment, saving valuable budget dollars and increasing the utilization of your fleet. Two (or three) Machines in One The Elliott HiReach lets you lift people or materials and even dig holes. Its large work platform easily lifts two workers and supplies. 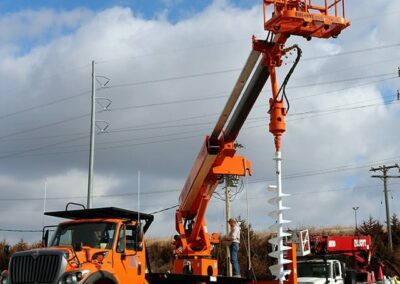 The unit’s material handling capabilities include the ability to lift heavy objects with the main boom winch and also lift loads from the platform’s jib winch. You can even equip your unit to dig holes, making it ideal for your sign and lighting installation. 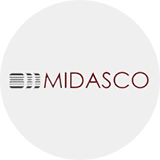 This multi-functionality reduces operating costs and increases utilization. 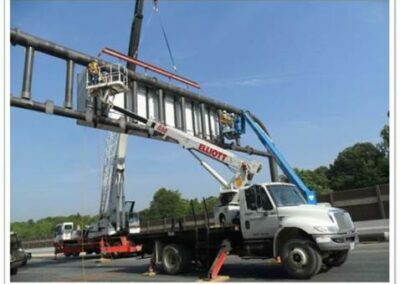 Minimize Traffic Disruption Elliott’s outrigger design arrangements accommodate tight spaces or obstacles including working on highway shoulders, over guardrails, on railways and in off-road applications. Our optional short jacking package lets you work in tight spaces, minimizing lane closures. What’s more, Elliott’s ‘point-and-shoot’ telescopic design maximizes your side reach and eliminates the worry of inadvertently swinging an articulated ‘knuckle’ into traffic. Dynasmooth Controls Built for reliability and simplicity, Elliott’s Dynasmooth controls come with industry-leading sensitivity features that allow the operator to conveniently adjust engine speed and controller voltage to smoothly feather the controls for a gentle ride, even when rotating the boom at heights over 100 feet. To maximize the sensitivity, Elliott’s hydraulic system gives you speed when it’s needed, and allows gentle movements when it isn’t. 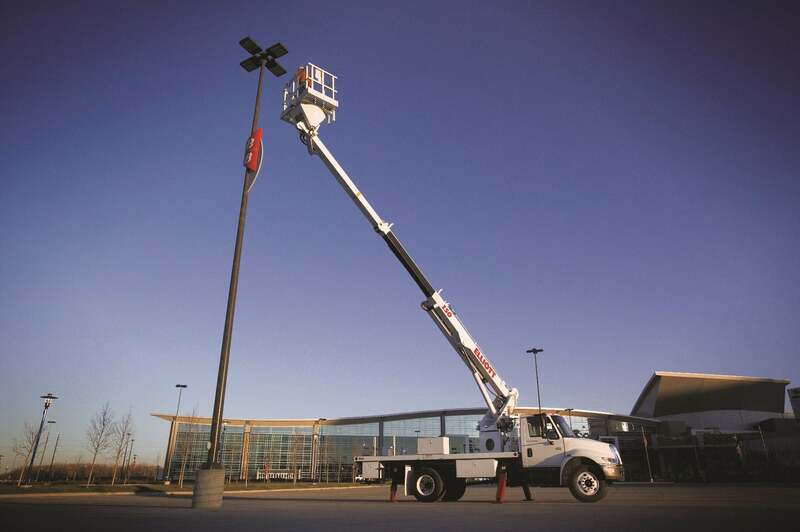 An “Office in the Sky” Elliott HiReach aerial work platforms feature oversized steel work platforms with more space for personnel and tools on the job site. 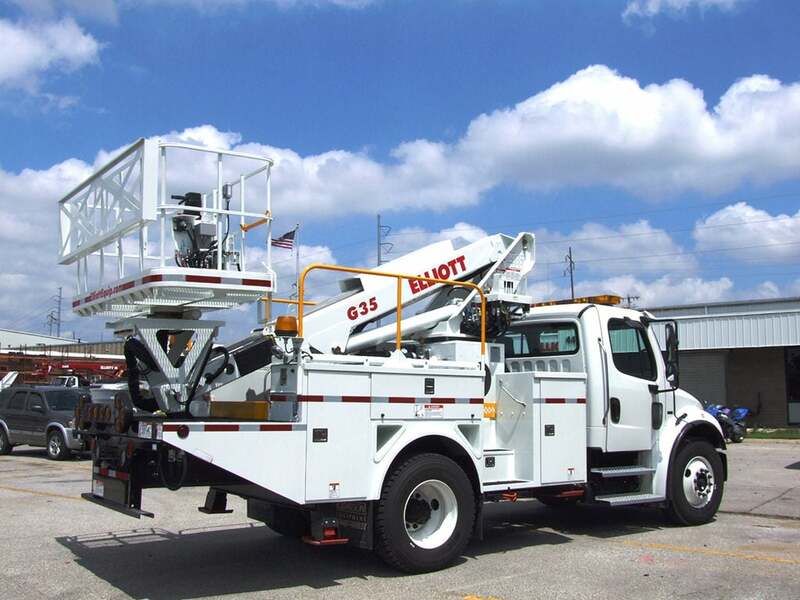 To assist with getting work done at height, Elliott’s oversized cable carrier can carry multiple tools into the work platform to maximize productivity including 110V, welding leads, oxy/acetylene hoses, air hose, pressure washer hose, and a hydraulic jib winch. Heavy Lifter By allowing you to lift loads with the main boom or the platform winch, your machine can double as a light duty crane, allowing you to use your unit for installation as well as maintenance work. Factory Customization Elliott has one of the industry’s strongest reputations for customization. This means more than just adding boxes or changing paint colors, it means building unique equipment specifically designed to make your operators more productive and make your brand stand out from the crowd. Contact us today to see examples of what we can build for your business. 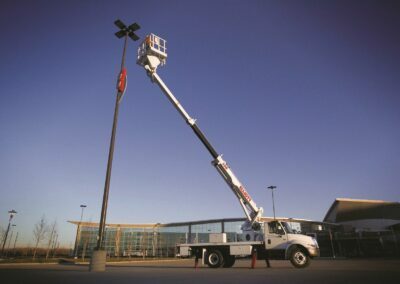 HiReach 500- to 1,000-lb. platform mounted jib winch. Lifetime structural warranty for your peace of mind. Hydraulic digger with wireless remotes. Special outriggers for short jacking, guard rail clearance and tight spaces. Service bodies, toolboxes and other storage configurations.